The D-Link EBR-2310 keeps your network extremely secure, with a built-in firewall to protect your network from hackers and other malicious attacks. And to give you even more peace-of-mind, the EBR-2310 includes sophisticated parental controls to monitor your children's internet usage and block inappropriate content. It’s a cinch to set up and install. The EBR-2310’s Quick Router Setup Wizard guides you through the process of setting up your network in minutes. Additionally, the browser-based setup interface means that all of the router's features and functions are simple to access, configure, edit—and, most of all, protect from unwanted access! 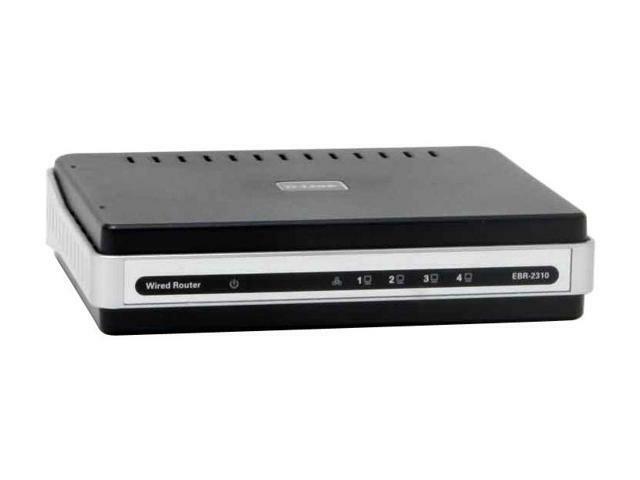 For a simple wired network for your home or small office, the easy-to-use D-Link EBR-2310 gets the job done. Simple Networking The D-Link EBR-2310 features one 10/100Mbps WAN port for broadband modem connection and four 10/100Mbps Ethernet ports for connections to up to four Ethernet-enabled PCs or network devices. The router integrates switching capabilities to efficiently manage your network traffic. Security Protection The D-Link EBR-2310 features a built-in firewall to safeguard your network from hackers and malicious attacks. Parental control features are included to monitor Internet usage and block inappropriate content. Easy to Install and Use With the Quick Router Setup Wizard, set up your network in minutes! A built-in Cable Tester Utility is included to help you diagnose and troubleshoot physical cable problems. Device Management: Internet Explorer v6 or later; or other Java-enabled Browsers. Easily Create a Basic Network to Share Your Internet Connection. Advanced Firewall Features and Parental Controls to Protect Your Network. Check E-mail, Chat with Friends, Share Files, and Enjoy Casual Gaming. 5.9" x 4.5" x 1.4"
Pros: Easy to configure and stable. Interface is straight forward and flexible - no need to look at the manual if you know anything about networking at all. Does what it says on the tin. Cons: only has 10/100 ports. Enabling features like QoS may drastically reduce total throughput. Other Thoughts: I'm using this in a home network where the approved modem was not playing nicely with my LAN (cable - about 125Mbps down, 12 up). I'm getting about 95Mbps down and 12 up through the EBR-2310 (but that drops to ~65 down and 1 up if you leave the QoS engine turned on). It has allowed me to configure my LAN the way I like. If it only had 10/100/1000 ports it would be perfect. Pros: Easy to set up, and brainless to just leave up and running. I would surmise that it would be reliable for most people in a small home network. Cons: Very limited, I have a Rev b1, so it is on the older side, and use it as an emergency firewall (things happen, like a firewall failing, which happened to me recently). Since I was last forced to use it (A certain computer store was still in business last time I needed to use it), my network has grown, with more than 30 devices connecting to the network this little guy just cannot keep up. It seems to be maxing out at 361 sessions, and throwing error messages about not being able to create any new sessions. Resulting in poor internet service and an unhappy household. Other Thoughts: This would be great in a less demanding environment, but it not up to snuff for what I would consider a standard household (4 phones, 2-4 tablets, 4-8 lap tops, 2-4 internet connected gaming systems, 2-4 set top boxes, 1-2 smart TVs) I have a bit more than this. I would not hesitate to install this in my grandmothers house, but may be detrimental to the modern family. Pros: It's good for very basic Internet use. Cons: The biggest issues I've had with this router is it can get bogged down when visiting large sites (ESPN, CNN, Facebook, etc) back to back. The router just can't handle all of the connections. It doesn't quickly close those connections after you've left the site. I honestly can't tell you the number of times I've become frustrated with this and simply unplugged the router to clear the connections. Other Thoughts: If you need a router, I highly recommend just about anything else. I went with a wireless router from another manufacturer that had favorable ratings and I'm very happy with it. I've not any issues with the router getting bogged down. Revision C doesn't have new firmware to enable years past 2012. Incorrect/mismatching dates in networking equipment can cause connection issues. Pros: I have owned this unit since Feb. 2009. I have had absolutely no problems with it since I bought it. It has been so long since I installed it that I can't remember how I did it. It was easy, though. I have had to power it off one time to get it going again when the power flashed and got the electrons confused. I wish everything I have owned was so dependable and durable. This is a legitimate and unbiased review, I promise you. Cons: None in nearly four years. Other Thoughts: I will say that when I bought my unit the cost was less than the cost it is now.....blame that on our politicians who love inflation and hate deflation, not Newegg. Pros: H/W ver C1, F/W ver 3.00 allows DHCP reservations and works perfectly. Other Thoughts: No way to upgrade h/w version A or B to the ver 3.00 firmware. I assume all the bad reviews are for the A&B hardware versions, since we've been using a h/w ver C at my business for a highspeed instrument network with ZERO problems. We bought two more and ended up getting version B that was pretty much useless (returned them). The only way to tell the difference is to call and have the operator check on the box and mail you that exact one! Pros: Easy set up and programmable. Very stable even after 2 years of continual operation. Cons: If multiple devices want access to the internet, for example, the router stops ALL of them to think about it. It comes back on after 30 seconds to a minute and processes the requests. But there is a notable lag time during high traffic periods from multiple devices. Tried all kinds of settings, but nothing does really alleviate this problem completely. Other Thoughts: Might be great for a single user network who switches devices on occasion. Not recommended for multiple simultaneous users with heavy traffic. Definitely NOT recommended for business use. Comments: I just need a router to be reliable and do not need a lot of special features. This gets the job done without any problems.